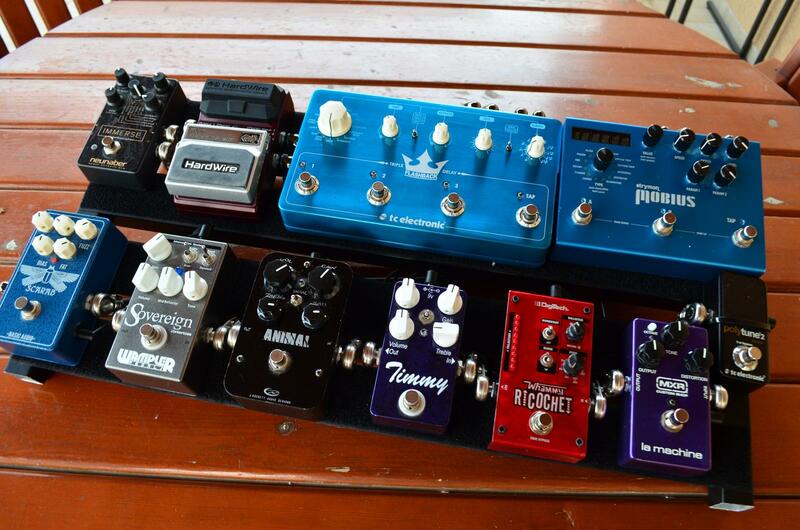 Your Effects Pedalboard !!! Pics !!! My mini board, which I've been using for a while. If I need more pedals I hook up the biggie board. Just got done cleaning it up with new tiny cables and soul food. View attachment 257547 Just got done cleaning it up with new tiny cables and soul food. How do you like the Soul Food? It's great. I use it as a classy tubescreamer. Great treble boost drive whatever it is. It's almost always on. Except when I'm playing something VERY clean. The pedal does have plenty of note definition when you balance the treble in as you add drive. It should cost much more. I got mine a couple of months ago, and really love it. I keep mine on all the time with the volume and treble set just past noon and the drive all the way off. It really "opens" up my amp. It doesn't make it sound as "boxxy", I recommend it too everybody. DIY wooden board. This is my at home, song writing board. Check out the pedal risers on the top row. I love them. Makes stomping on the top row much easier and I run cables through the bottoms of them. I tend to gig with much less, and take much more to a studio. This is just right for at home wanting to mess with different flavors. 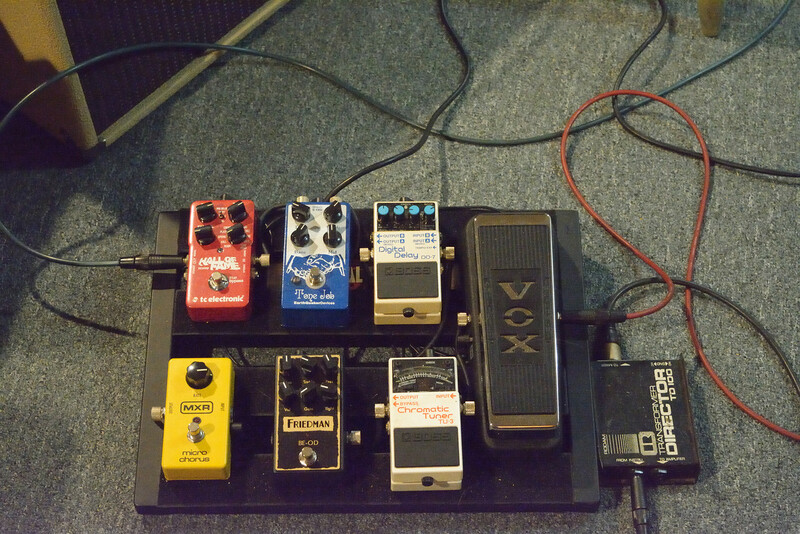 Sometimes I'll throw a wah or volume pedal before everything in the chain depending on what I need. Sometimes I'll replace the fuzz factory with a philosophers tone compressor. Especially if I'm playing funk or country stuff. It's all powered by a voodoo labs power plus 2 underneath. Off went the phaser and back goes the Soul Food, I can do far more with it. 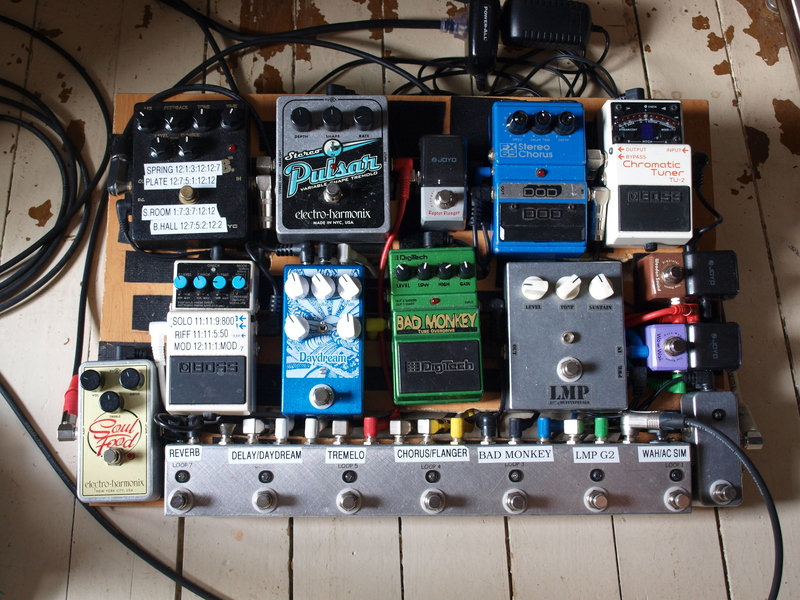 Still tempted by mini-pedal swaps to free up space. By looking at your board, ES Gibson, and Goldtop in this pic....I would assume you are a "Pro" guitar player. Meaning you play guitar for a living. I say and ask with the utmost respect, killer looking board! I've been generally pretty pleased with my Diago pedalboard: it's solidly made, a nice size and looks good too. 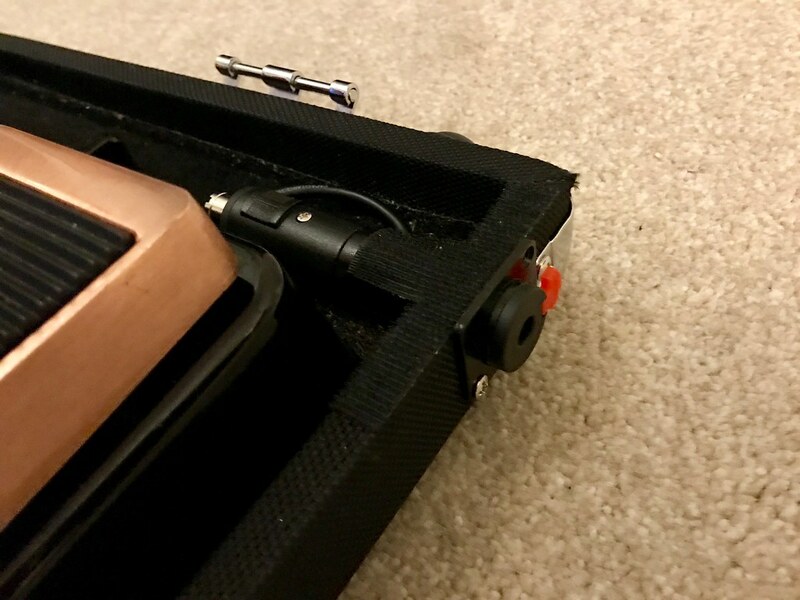 The one thing that has annoyed me, however, is the "lip" around the side which prevents you from being able to plug in to the first pedal unless it's a decent distance away from the lip or is on a "riser" - which is the option I went for but this meant I had to run something other than the wah first (since rising that up wasn't an option!) and that in turn meant I couldn't get the wah all the way over to the right where I would most prefer it. Boo! So, today I finally got around to doing something I've been meaning to for ages: I installed a couple of solderless locking jack sockets through the "lip” on either side. These give you a locking 1/4” jack socket at both ends so you simply wire up with patch cables permanently and then use the exterior sockets for connecting the board up to guitar/amp. All very neat and professional! 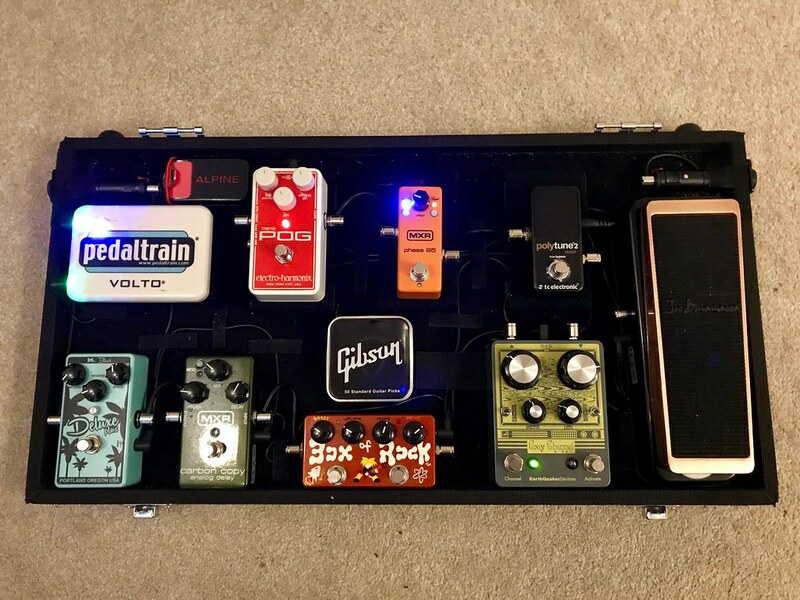 Now all my pedals can be wired up *exactly* how I want them: including wah-first and as far over to the right as possible. Good news is....you got a "Soul Food" up in the right top corner. nice mod on yur Diago board. Do you power the whole thing with the Volto?? Thanks - yes, the volto does the job pretty nicely and easily does a 3-4 hour rehearsal. Would probably do twice that but I tend not to risk it! Mind you, I've deliberately chosen analogue pedals with a relatively low current draw: think the Carbon Copy is the only thing over 100mA - even the Nano POG is only 25mA with everything else probably < 20mA per pedal. Ok. Current on board pedals. Not sure about the pedal order there but I hope you've got a decent buffer up front!! Very neat sockets but any chance of the external jack plugs getting stepped on and snapped?